A garage agreements book from the 1930s. Homepage. 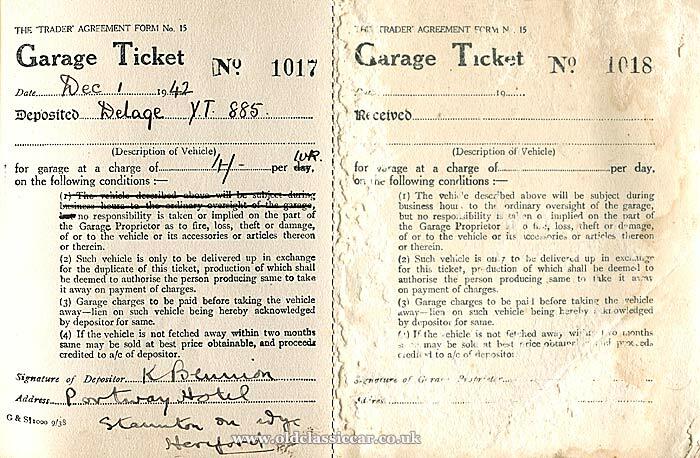 This page: A part-used ticket book for cars booked in to a garage. This pre-war book belonged to Welland's Garage in Berrow, Burnham-on-Sea, and is one of many surviving pieces of ephemera that now feature on OCC, thanks to the founder's daughter - Jenny - who wanted these items to find a home. 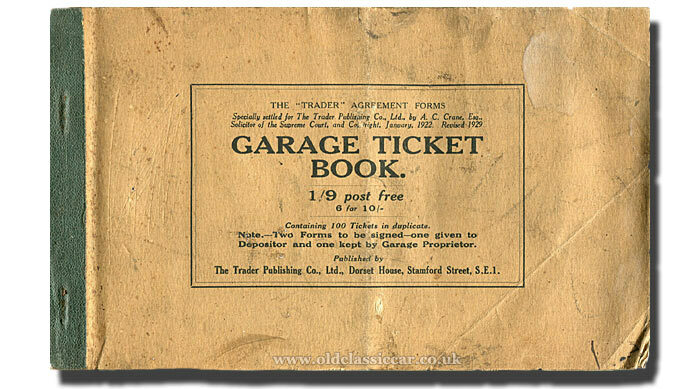 This "Garage Ticket Book" was published by The Trader Publishing Co. Limited. The first copies were drawn up in 1922, with this revised version going on sale to motor traders in 1929. A code in the book suggests that this copy was published in September of 1938. For its age, this unusual item has survived in reasonable condition, bar the attentions of a mouse to several pages in the centre of the book, which fortunately were unused so contained no handwritten entries. A number of faint handwritten notes can be seen across the front and rear covers, with a stamp inside the rear cover confirming the ticket book's owner - Mr C. Welland. This part-used publication was used to book in vehicles that were entering into the garage's care, one part remaining with the garage, the other would have been passed to whoever owned the car being left at the garage. The majority of the book remains unused, but fortunately the first sixteen pages do contain details of cars (and motorcycles) that Welland's Garage took in. The garage was opened in 1934, and the earliest entry in the book - for a locally-owned Hillman - is from 1938. The final entry, dated December 1st 1942, is also for the most unusual car to appear within these pages - a Delage registered YT 885, which was deposited at the garage by a K. Bennion, of the Portway Hotel, in Staunton on Wye, Hereford. This probably refers to the Portway Inn Hotel, a 16th Century establishment that survives to this day, in the Wye Valley. Presumably therefore, the Delage belonged to the hotel's owner. A check of the YT registrations page advises that the car was London-registered, between June and September 1927. The registration is no longer listed as current. 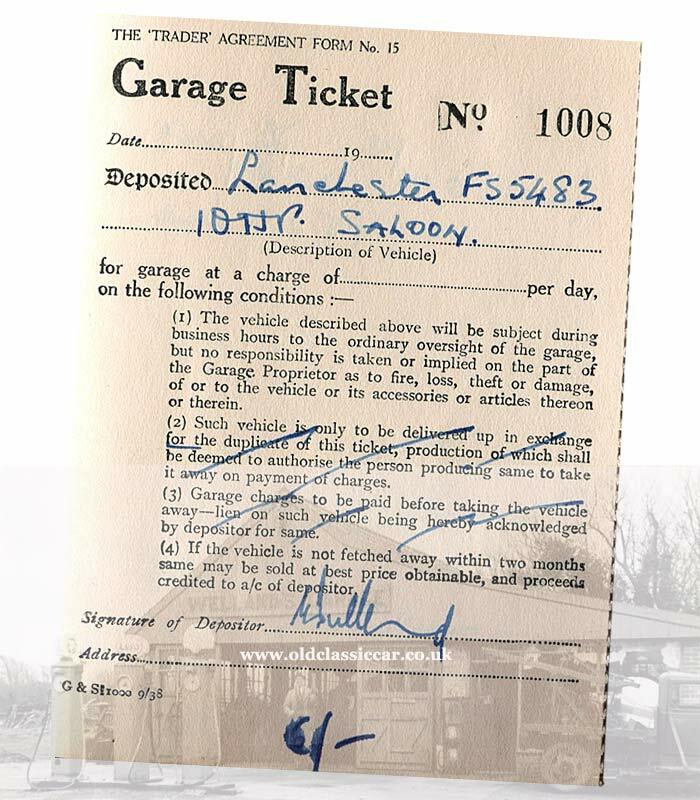 Several entries in the Garage Ticket Book suggest that rather then being worked on, the cars were in fact being stored - due to WW2 in later instances perhaps, and the restrictions on motoring that the population then faced. I wonder which model of Delage YT 885 was? And what happened to it, and its owner? As can be seen, the garage retained the lefthand slip in the book, while the customer would take away the torn-off righthand part. The list of cars that Mr Welland took in, and are recorded in this book, are listed below with whatever discernable information is given, beginning in the autumn of 1938 but not entirely in date order for some reason. I suspect this book may have been used solely to record vehicles being stored. None of the above registrations is still logged with DVLA, so chances are all these vehicles are long-gone. Maybe one or two survive, stored away in a building and no longer registered, or registered but on later replacement registrations, but I've a feeling that they're all residing in that great scrapyard in the sky. More items of paperwork relating to early vehicles and garages can be found in the Motoring Collectables section here at Old Classic Car. Photographs of Welland's Garage, from which this came, and links to other items from the same source, may be found here.